The Mikoyan-Gurevich MiG-23 (Russian: Микоян и Гуревич МиГ-23; NATO reporting name: Flogger) is a variable-geometry fighter aircraft, designed by the Mikoyan-Gurevich design bureau in the Soviet Union. It is a third-generation jet fighter, along with similar Soviet fighters such as the MiG-25 "Foxbat" and Su-15 "Flagon". It was the first Soviet fighter to field a look-down/shoot-down radar and one of the first to be armed with beyond visual range missiles. Production started in 1970 and reached large numbers with over 5,000 aircraft built. Today the MiG-23 remains in limited service with some export customers. The basic design was also used as the basis for the Mikoyan MiG-27, a dedicated ground-attack variant. Among many minor changes, the MiG-27 replaced the MiG-23's nose-mounted radar system with an optical panel holding a laser designator and a TV camera. The 23-11 featured variable-geometry wings which could be set to angles of 16, 45 and 72 degrees, and it was clearly more promising. 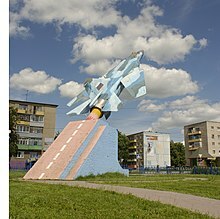 The maiden flight of 23–11 took place on 10 June 1967, flown by the famous MiG test pilot Alexander Vasilevich Fedotov (who set the absolute altitude record in 1977 in a Mikoyan-Gurevich MiG-25). Six more flight prototypes and two static-test prototypes were prepared for further flight and system testing. All featured the Tumansky R-27-300 turbojet engine with a thrust of 77 kN (17,300 lbf). The order to start series production of the MiG-23 was given in December 1967. The first production "MiG-23S" (NATO reporting name 'Flogger-A') took to the air on 21 May 1969, with Fedotov at the controls. MiG-23M "Flogger-B" armed with R-23 and R-60 missiles. Western and Russian aviation historians usually differ in respect to combat record for their military vehicles and doctrines part due to the bias in favor of their respective national industries and academies. They also usually accept claims going along with their respective political views since usually many conflicting and contradictory reports are written and accepted by their respective historians. Before recent years, with widespread use of hand portable cameras, little pictorial evidence could be published about specific losses and victories of the different combat systems, with a limited number of losses and victories confirmed by both parties. 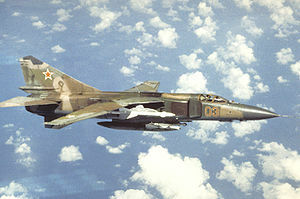 Western sources, generally attribute a very limited number of confirmed air-to-air victories to the MiG-23 while reporting a higher number of MiG-23s downed mostly by Israeli Air Force in 1982, while Russian sources generally decrease the number of losses and increase the number of inflicted kills bringing the air-to-air kill to loss ratio to around parity. The aircraft was not used in large numbers by the non-Soviet air forces of the Warsaw Pact as originally envisioned. When the MiG-23s were initially deployed, they were considered the elites of the Eastern Bloc air forces. However, very quickly the disadvantages became evident and the MiG-23 did not replace the MiG-21 as initially intended. The aircraft had some deficiencies that limited its operational serviceability and its hourly operating cost was thus higher than the MiG-21s. The Eastern Bloc air forces used their MiG-23s to replace MiG-17s and MiG-19s still in service. By 1990, over 1,500 MiG-23s of different models were in service with the VVS and the V-PVO. With the dissolution of the Soviet Union, the new Russian Air Force began to cut back its fighter force, and it was decided the single-engined MiG-23s and MiG-27s were to be retired to operational storage. 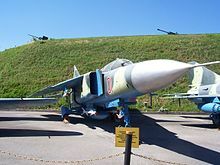 The last model to serve was the MiG-23P air defense variant and it was retired on 1 May 1998. When East and West Germany unified, no MiG-23s were transferred to the German Air Force, but twelve former East German MiG-23s were supplied to the US. When Czechoslovakia split into the Czech Republic and Slovakia, the Czechs received all the MiG-23s, which were retired in 1998. Hungary retired their MiG-23s in 1996, Poland in 1999, Romania in 2000, and Bulgaria in 2004. The MiG-23 was the Soviet Air Force's "Top Gun"-equivalent aggressor aircraft from the late 1970s to the late 1980s. It proved a difficult opponent for early MiG-29 variants flown by inexperienced pilots. Exercises showed when well-flown, a MiG-23MLD could achieve favorable kill ratios against the MiG-29 in mock combat by using hit-and-run tactics and not engaging the MiG-29s in dogfights. Usually the aggressor MiG-23MLDs had a shark mouth painted on the nose just aft of the radome, and many were piloted by Soviet–Afghan War veterans. In the late 1980s, these aggressor MiG-23s were replaced by MiG-29s, also featuring shark mouths. Soviet MiG-23s were used over Afghanistan. Some of them were claimed to have been shot down. Soviet and Afghan MiG-23s and Pakistani F-16s clashed a few times during the Soviet–Afghan War from 1987. Two MiG-23 were claimed shot down in air to air fight by Pakistani F-16s when crossing the border while one F-16 was shot down on 29 April 1987. Pakistani and Western sources consider it a friendly fire incident but the Soviet-backed Afghan government of the time claimed that Soviet aircraft downed the Pakistani F-16 – a claim that The New York Times and the Washington Post also reported. According to a Russian version of the event, the F-16 was shot down when Pakistani F-16s encountered Soviet MiG-23MLDs. Soviet MiG-23MLD pilots, while on a bombing raid along the Pakistani-Afghan border, reported being attacked by F-16s and then seeing one F-16 explode. It could have been downed by gunfire from a MiG whose pilot did not report the kill, because Soviet pilots were not allowed to attack Pakistani aircraft without permission. In 1988, Soviet MiG-23MLDs using R-23s (NATO: AA-7 "Apex") downed two Iranian AH-1J Cobras that had intruded into Afghan airspace. In a similar incident a decade earlier, on 21 June 1978, a PVO MiG-23M flown by Pilot Captain V. Shkinder shot down two Iranian Boeing CH-47 Chinook helicopters that had trespassed into Soviet airspace, one helicopter being dispatched by two R-60 missiles and the other by cannon fire. The USSR supported the People's Democratic Republic of Yemen with Soviet Air Force MiG-23BN and MiG-25R based in Aden starting from the late Seventies. During the South Yemen Civil War in January 1986, the Soviet MiG-23BN fleet flew strikes in support of loyalist forces. It is not clear if these MiG-23 were ever transferred to the South Yemeni control and later to the unified Yemeni Air Force or they always remained under Soviet control and withdrew later. The first MiG-23s were supplied to Syria on 14 October 1973, when two MiG-23MSs and two MiG-23UBs were shipped in crates, aboard An-12B transports. By the time these planes could be assembled, flight-tested and their crews made combat ready, the war with Israel was over. During 1974 several Syrian MiG-23s were lost in accidents. The process of making the MiG-23 operational was complex and difficult, and only eight were operational by 1974. The first MiG-23s to see combat were export variants with many limitations. For example, the MiG-23MS lacked a radar warning receiver. In addition, compared to the MiG-21, the aircraft was mechanically complex and expensive and also less agile. Early export variants also lacked many "war reserve modes" in their radars, making them vulnerable against electronic countermeasures (ECM), at which the Israelis were especially proficient. On 13 April 1974, after almost 100 days of artillery exchanges and skirmishes along the Golan Heights, Syrian helicopters delivered commandos to attack the Israeli observation post at Jebel Sheikh. This provoked heavy clashes in the air and on the ground for almost a week. 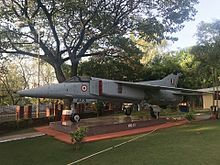 On 19 April 1974, Captain al-Masry, flying a MiG-23MS on a weapons test mission, spotted a group of IAF F-4Es and shot two of them down after firing three missiles. He was about to attack another F-4 with cannon fire, but was shot down by friendly fire from a SAM battery. Due to this success, an additional 24 MiG-23MS interceptors, as well as a similar number of MiG-23BN strike variants, were delivered to Syria during the following year. In 1978 deliveries of MiG-23MFs started and two squadrons were equipped with them. The MiG-23MF, MiG-23MS and MiG-23BN were used in combat by Syria over Lebanon between 1981 and 1985. On 26 April 1981, Syria claimed that two Israeli A-4 Skyhawks attacking a camp in Sidon were shot down by two MiG-23MSs. However, Israel does not report any loss of aircraft from this incident. Russian historian Vladimir Ilyin writes that the Syrians lost six MiG-23MFs, four MiG-23MSs and a few MiG-23BNs in June 1982. One more MiG-23 fighter was lost in July. The Israelis also claimed that they shot down two MiG-23s in 1985, which the Syrians deny. Overall, 11–13 Syrian MiG-23 fighter variants were lost in air combat from 1982 to 1985. Israel confirms only loss of BQM-34 Firebee which was downed by Syrian MiG-23MF on 6 June 1982. At the end of April 2002 Syrian MiG-23ML shot down an Israeli UAV with an air-to-air missile near As-Suwayda. A former Syrian Air Force MiG-23MS became iconic of the Siege of Abu al-Duhur Airbase: on 7 March 2012, Syrian rebels used a 9K115-2 Metis-M anti-tank guided missile to hit the derelict MiG. Later, in March 2013 they entered in the base, showing the worn out and damaged MiG. Finally, in May 2013, the Syrian Air Force bombed it to completely destroy the wreck. Syrian MiG-23BNs bombed the city of Aleppo on 24 July 2012, becoming the first use of fixed-wing aircraft for bombing in the Syrian civil war. On 13 August 2012, a Syrian MiG-23BN was reportedly shot down by the rebels of the Free Syrian Army near Deir ez-Zor, although the government claimed that it went down due to technical difficulties. Since then, Syrian Air Force MiG-23s together with different Syrian Air Force fighter jets have regularly been spotted performing attack runs on Syrian insurgents, who have claimed different MiGs being shot down or destroyed on the ground on different occasions. On 23 March 2014, one Syrian MiG-23 was shot down after being hit by an AIM-9 Sidewinder fired by a Turkish F-16 in the vicinity of the Syrian town of Kessab. The pilot ejected safely and was recovered by friendly forces. Turkish sources said the fighter violated Turkish airspace and it was downed after several radio warnings while approaching the border. Another Syrian MiG-23 returned to Syria after trespassing into Turkish airspace. The MiG-23 took part in the Iran–Iraq War and was used in both air-to-air and air-to-ground roles. The reports about performance in air combat are mixed – some authors claim that Iraqi MiG-23s had some victories and several losses against Iranian F-14s, F-5s and F-4s. Iranian Air Force Colonel, Mohammed-Hashem All-e-Agha was shot down by an Iraqi MiG-23ML while flying his F-14A on 11 August 1984. Iranian Air Force Colonel Abdolbaghi Darvish was shot down by an Iraqi MiG-23ML while flying his Fokker F27-600 on 20 February 1986. All 49 crew members and Passengers were killed. The aircraft was carrying a delegation of military and government officials on a mission. Iranian Air Force Captain Bahram Ghanei was shot down by a MiG-23ML while flying his F-14A on 17 January 1987. Known Iraqi MiG-23 fighter pilot was Captain Omar Goben. He shot down at least one F-5E and one F-4E with a MiG-23, and two F-5Es and one F-4E with a MiG-21. According to researcher Tom Cooper, Iranian F-14s caused exceptionally heavy losses to the MiG-23s (most of them bombers, model MiG-23BN) early in the war, much to the disappointment of the Iraqi Air Force, which thought that the Soviet fighter would be a match for the Tomcat. During the Iran-Iraq War at least 58 MiG-23s are claimed to be shot down by F-14s (15 of these are confirmed according to Cooper), and 20 MiG-23s are claimed by F-4s (16 confirmed according to Cooper). According to official Iraqi data only 29 MiG-23s were lost during the entire war (between 20 and 28 of them were shot down by AAA, enemy fighters or friendly fire). Iraqi MiG-23MS/MFs (fighters) were used in the first half of the war scoring no less than 8 kills and suffering 2 MiG-23MS and 4 MiG-23MF losses. MiG-23MLs (fighters) were used in the second half of the war. They possibly scored 7 kills (including 2 F-14) while possibly suffering 3 losses. MiG-23BNs (ground-attack variant) were successfully used against ground targets. On 22 September 1980, BNs were used in first combat sorties against Iran. Two F-4 Phantoms were destroyed at Mehrabad Air Base in BNs attack. However up to 22 MiG-23BNs were downed by Iranian interceptors during the war. According to other sources, 16 BNs were lost during war, 13 of them in combat. According to Iranian sources, four MiG-23BNs were shot down by F-14s on 29 October 1980, but the victory was not confirmed. On 2 August 1990, the Iraqi Air Force supported the Invasion of Kuwait with MiG-23BN and Su-22 aircraft as the main strike assets. A number of Iraqi aircraft and helicopters were claimed shot down by Kuwaiti air defense MIM-23 Hawk SAM sites, among them a MiG-23BN. During the Gulf War, the United States Air Force reported downing eight Iraqi MiG-23s with F-15s, six of them were confirmed. [clarification needed][by whom?] Up to 12 MiG-23s flew over the border, landing in Iran to avoid destruction and several other airframes were destroyed or damaged on the ground or in the shelters during the raids over their air bases. The United States stated that the losses of the F-16Cs were caused by 2K12 Kub and S-125 Neva/Pechora surface-to-air missiles rather than enemy aircraft. Also, no Tornado loss is attributed to enemy aircraft as per the Royal Air Force and the Italian Air Force. On 17 January 1993, a USAF F-16C destroyed an Iraqi MiG-23 with an AMRAAM missile. On 9 September 1999, a lone MiG-23 crossed the no-fly zone heading towards a flight of F-14s. One F-14 fired an AIM-54 Phoenix at the MiG but missed and the MiG headed back north. In 2003, during Operation Iraqi Freedom, the entire Iraqi Air Force remained grounded with several airframes found by US and allied forces around the Iraqi air bases in derelict condition after the invasion. The invasion marked the end of Iraqi service for the MiG-23. Cuban MiG-23MLs and South African Mirage F1 pilots had several encounters during the Cuban intervention in Angola, one of which resulted in severe damage to a Mirage F1. 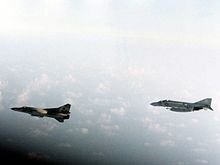 On 27 September 1987, during Operation Moduler, two MiG-23 pilots surprised a pair of Mirages and fired missiles: Alberto Ley Rivas engaged a Mirage flown by Capt Arthur Douglas Piercy with a pair of R-23Rs (some sources say a R-60), while the other Cuban pilot fired a single R-60 at a Mirage flown by Captain Carlo Gagiano. Although the missiles homed on the Mirages, only one R-23R exploded close enough to cause damage to the landing hydraulics of Capt Piercy's Mirage (and, according to some accounts, the aircraft's drag chute). The damage likely contributed to the Mirage veering off the runway on landing, after which the nose gear collapsed. The nose hit the ground so hard that Piercy's ejection seat fired. As a result of this ground level ejection, Piercy was paralyzed. The aircraft was written off, but a large portion of the airframe and components were used to repair another accident damaged Mirage F-1 and return it to service. In total, the Cubans claimed 6 air victories MiG-23 (1 destroyed, 1 damaged and 4 were unconfirmed). FAPLA MiG-23s outclassed SAAF Mirage F-1CZ and F-1AZ fighters in terms of power/acceleration, radar/avionics capabilities, and air-to-air weapons. The MiG-23's R-23 and R-60 missiles gave FAPLA pilots the ability to engage SAAF aircraft from most aspects. The SAAF, hobbled by an international arms embargo, was forced to carry an obsolescent version of the French Matra R.550 Magic missile or early-generation V-3 Kukri missiles, which had limited range and performance relative to the AA-8 and AA-7. Despite these limitations, SAAF pilots were able to vector within the firing envelope and fire AAMs at MiG-23s (gun camera shots evidence this). The missiles either missed or exploded ineffectually behind in the tail plume rather than homing on the hot airframe. UNITA rebels, opposing Cuban/MPLA forces, shot down a number of MiG-23s with American-supplied FIM-92 Stinger MANPAD missiles. South African ground forces shot down a MiG-23, which was prosecuting a raid on the Calueque Dam, by using the Ystervark (porcupine) 20 mm AA gun. Libyan MiG-23 over Gulf of Sidra in August 1981, being followed by an F-4 just before the first Gulf of Sidra incident. Libya received a total of 54 MiG-23MS and MiG-23Us between 1974 and 1976, followed by a similar number of MiG-23BNs. Many of these were immediately put into storage, but at least 20 MiG-23MSs and MiG-23UBs entered service with the 1023rd Squadron and 1124th Squadron. One Libyan MiG-23MS was shot down by an Egyptian MiG-21 fighter during and immediately after the Libyan–Egyptian War in 1977 while supporting a strike on the airfield at Mersa-Matruh, forcing the remaining MiG to abort the mission. In one skirmish in 1979, two LARAF MiG-23MS engaged two EAF MiG-21MF which had been upgraded to carry Western air-to-air missiles such as the AIM-9P3 Sidewinder. The Libyan pilots made the mistake of trying to outmaneuver the more nimble Egyptian MiG-21s, and one MiG-23MS was shot down by Maj. Sal Mohammad with an AIM-9P3 Sidewinder missile, while the other used its superior speed to escape. On 18 July 1980, the wreckage of an LARAF MiG-23MS was found on the northern side of Mount Sila, in the middle of the Italian province of Calabria. The deceased pilot, Captain Ezzedin Fadhel Khalil, was found still strapped to his ejection seat. Libyan MiG-23s were employed during the Chadian–Libyan conflict performing different roles in the 1980s. On 5 January 1987, a Libyan MiG-23 was shot down and few months later, on 5 September 1987, Chadian forces performed a land raid against Maaten al-Sarra Air Base in Libya, destroying several Libyan aircraft on the ground, among them, three MiG-23s. Two Libyan MiG-23MS fighters were shot down by U.S. Navy F-14s in the Second Gulf of Sidra incident in 1989. In the 2011 Libyan civil war, Libyan Air Force MiG-23s were used to bomb rebel positions. On 15 March 2011, a rebel website reported that opposition forces started using a captured MiG-23 and a helicopter to sink 2 loyalist ships and bomb some tank positions. On 19 March 2011, a MiG-23BN of the Free Libyan Air Force was shot down over Benghazi by its own air defenses, who mistook it for a loyalist aircraft. The pilot was killed after he ejected too late. On 26 March 2011, five MiG-23s together with two Mi-35 helicopters were destroyed by the French Air Force while parked at Misrata airport, early reports misidentified the fixed wing aircraft as G-2 Galebs. On 9 April, a rebel MiG-23 was intercepted over Benghazi by NATO aircraft and escorted back to its base for violating the UN no-fly zone. A limited number of MiG-23's which survived the 2011 Libyan civil war and NATO bombings were involved in air strikes between the opposing Libyan House of Representatives and the rival General National Congress during the Second Libyan Civil War with both parties controlling a limited number of aircraft. On 23 March 2015, a New General National Congress operated MiG-23UB was shot down while bombing Al Watiya airbase, controlled by the Libyan House of Representative probably with an Igla-S MANPADS. Both pilots were killed. At the beginning of 2016, Libyan House of Representatives forces controlled three airworthy MiG-23s among other aircraft, two MiG-23MLA and one MiG-23UB. They were all lost in three separate occasions with a first MiG-23MLA, serial 6472, lost near Benina airbase on 4 January, after an airstrike, the second MiG-23MLA, serial 6132, lost on 8 February while conducting air strikes against Islamic State near Derna and the MiG-23UB, serial 7834, lost on 12 February 2016 while operating west of Benghazi, claimed shot down by the Islamic State with the official government attributing the loss to anti aircraft artillery. In all the occasions the aircrews ejected while the cause of the first two crashes remained debated between hostile fire and mechanical causes. On 28 February 2016, a MiG-23MLA serial 6453 was restored to flying status after several years, becoming the only MiG-23 in service with the Libyan Air Force as of March 2016, performing missions against enemy positions and vehicles since March 2016. In the following weeks, both the Libyan Air Force and the opposing Libyan Dawn Air Force, restored a number of MiG-23BN, MiG-23ML and MiG-23UB to flying status and they were recorded while flying over Libyan skyes and striking enemy positions. A Hungarian MiG-23 in flight. Egypt became one of the first export customers when in 1974 bought eight MiG-23MS interceptors, eight MiG-23BN strikers and four MIG-23U trainers, concentrating them into a single regiment based at Mersa Matruh. By 1975 all Egyptian MiG-23s had been withdrawn from active duty and placed in storage due to the Egyptian foreign policy shifting towards the West and thus losing USSR support. In 1978 China purchased two MiG-23MS interceptors, two MiG-23BNs, two MiG-23Us, ten MiG-21MFs, and ten KSR-2 (AS-5 Kelt) air-to-surface missiles in exchange for spare parts and technical support for the Egyptian fleet of Soviet-supplied MiG-17 Frescos and MiG-21s. The Chinese used the aircraft as the basis for their J-9 project, which never ventured beyond the research phase. Some time later the remaining six MiG-23MS examples and six MiG-23BNs, as well as 16 MiG-21MFs, two Sukhoi Su-20 Fitters, two MiG-21Us, two Mil Mi-8 Hips and ten KSR-2 were purchased for the Foreign Technology Division, a special department of the USAF, responsible for evaluating adversary technologies. These were exchanged for weapons and spares support, including AIM-9J/P Sidewinder missiles, which were installed on remaining Egyptian MiG-21s. MiG-23s supplied by the Soviet Union to Mengistu Haile Mariam's Derg were heavily used by the Ethiopian Air Force against the array of rebel guerillas fighting the government during the Ethiopian Civil War. According to a 1990 Human Rights Watch report, the attacks, often using napalm or phosphorus and cluster munitions, were not only aimed at the rebels, but against civilian populations (in both Eritrea and Ethiopia) and humanitarian convoys in a deliberate fashion. Ethiopian MiG-23s were used in ground attack and strike missions during the border war with Eritrea from May 1998 to June 2000, even striking targets at the airport in the Eritrean capital city, Asmara on several occasions. Three Ethiopian MiG-23BNs were claimed shot down by Eritrean MiG-29s. On 26 May, the Indian forces started air strikes during the Kargil War. Flying from the Indian airfields of Srinagar, Avantipur and Adampur, MiG-23BN, joined the other Indian strike aircraft, MiG-21s, MiG-27s, Jaguars and Mirage 2000 in striking insurgent positions. 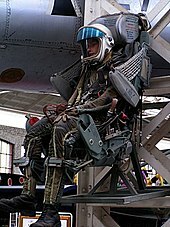 The KM-1 ejection seat, used in the MiG-21 and MiG-23. U.S. and Israeli reports also found that the MiG-23's Head-Up Display (HUD) doubles as a radarscope, allowing the pilot to keep his eyes focused at infinity while operating his radar. This allowed the Soviets to omit the separate radarscope from the MiG-23. 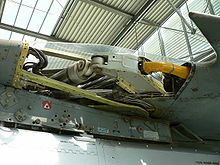 This feature was carried over into the MiG-29, though in that aircraft, a cathode ray tube (CRT) is carried on the upper right corner to double as a radarscope. Western opinions about this "head-up radarscope" are mixed. The Israelis were impressed, but an American F-16 pilot criticized it as "sticking a transparent map in front of the HUD" and not providing a three-dimensional presentation that would accurately cue a pilot's eyes to look for a fighter as it appears in a particular direction. Additionally, a Cuban pilot flew a MiG-23BN to the U.S. in 1991, and a Libyan MiG-23 pilot also defected to Greece in 1981. In both cases, the aircraft were later repatriated. The early MiG-23M series was also used to test the American Northrop F-5s captured by the North Vietnamese and sent to the former USSR for evaluation. The Russians acknowledged the F-5 was a very agile aircraft, and at some speeds and altitudes better than the MiG-23M, one of the main reasons the MiG-23MLD and MiG-29 developments were started. These tests allowed the Russians to make modifications to several of their fourth-generation aircraft. The MiG-23, however, was not designed to combat F-5s, a weakness reflected by early MiG-23 variants. ("Flogger-A") was the prototype built for testing, and it lacked the sawtooth leading edge that later appeared on all MiG-23/-27 models. This experimental model was the common basic design that both the MiG-23/-27 and Sukhoi Su-24 were based on, but the Su-24 experienced much greater modification. ("Flogger-A") was the pre-production model that lacked the hardpoints on later production versions, but the sawtooth leading edge appeared on this model, and it was also armed with guns. This model marked the divergence of the MiG-23/-27 and Su-24 from their common ancestor. ("Flogger-A") was the initial production variant. Only around 60 were built between 1969 and 1970. These aircraft were used for both flight and operational testing. The MiG-23S had an improved R-27F2-300 turbojet engine with a maximum thrust of 98 kN (22,000 lbf). As the Sapfir-23 radar was delayed, the aircraft were installed with the S-21 weapons control system with the RP-22SM radar—basically the same weapons system as in the MiG-21MF/bis. A twin-barreled 23 mm GSh-23L gun with 200 rounds of ammunition was fitted under the fuselage. This variant suffered from various teething problems and was never fielded as an operational fighter. ("Flogger-A") was the second pre-production variant, which was also known as the MiG-23 Type 1971. It was considerably modified compared to the MiG-23S: it had the full S-23 weapons suite, featuring a Sapfir-23L radar coupled with Vympel R-23R (NATO: AA-7 "Apex") BVR missiles. It also had a further improved R-27F2M-300 (later redesignated Khatchaturov R-29-300) engine with a maximum thrust of 118 kN (26,500 lbf). The modified "type 2" wing had an increased wing area and a larger sawtooth leading edge. The slats were deleted and wing sweep was increased by 2.5 degrees; wing positions were changed to 18.5, 47.5 and 74.5 degrees, respectively. The tail fin was moved further aft, and an extra fuel tank was added to the rear fuselage, as in the two-seat variant (see below). Around 80 examples were manufactured. The overall reliability was increased over the previous variant, but the "Sapfir" radar still proved to be immature. MiG-23M "Flogger-B" on display at the Museum of the Great Patriotic war in Kiev. ("Flogger-B") This variant first flew in June 1972. It was the first truly mass-produced version of the MiG-23, and the first VVS fighter to feature look-down/shoot-down capabilities (although this capability was initially very limited). The wing was modified again and now featured leading-edge slats. The Tumansky R-29 (R-29A) engine was now rated for 123 kN (27,600 lbf). It finally had the definitive sensor suite: an improved Sapfir-23D (NATO: 'High Lark') radar, a TP-23 infra-red search and track (IRST) sensor and an ASP-23D gunsight. The "High Lark" radar had a detection range of some 45 km against a high-flying, fighter-sized target. It was not a true Doppler radar but instead utilized the less effective "envelope detection" technique, similar to some radars on Western fighters of the 1960s. ("Flogger-B") This was an export derivative of the MiG-23M originally intended to be exported to Warsaw Pact countries, but it was also sold to many other allies and clients, as most export customers were dissatisfied with the rather primitive MiG-23MS. It actually came in two versions. The first one was sold to Warsaw Pact allies, and it was essentially identical to Soviet MiG-23M, with small changes in "identify friend or foe" (IFF) transponders and communications equipment. The second variant was sold outside Eastern Europe and it had a different IFF and communications suite (usually with the datalink removed), and downgraded radar, which lacked the electronic counter-countermeasure (ECCM) features and modes of the baseline "High Lark". This variant was more popular abroad than the MiG-23MS and considerable numbers were exported, especially to the Middle East. The infrared system had a detection range of around 30 km against high-flying bombers, but less for fighter-sized targets. The aircraft was also equipped with a Lasur-SMA datalink. The standard armament consisted of two radar- or infrared-guided Vympel R-23 (NATO: AA-7 "Apex") BVR missiles and two Molniya R-60 (NATO: AA-8 "Aphid") short-ranged infrared missiles. From 1974 onwards, double pylons were installed for the R-60s, enabling up to four missiles to be carried. Bombs, rockets and missiles could be carried for ground attack. Later, compatibility for the radio-guided Kh-23 (NATO: AS-7 "Kerry") ground-attack missile was added. Most Soviet MiGs were also wired to carry tactical nuclear weapons. Some 1300 MiG-23Ms were produced for the VVS and Soviet Air Defense Forces (PVO Strany) between 1972 and 1978. It was the most important Soviet fighter type from the mid-to-late 1970s. ("Flogger-C") The MiG-23U was a twin-seat training variant. It was based on the MiG-23S, but featured a lengthened cockpit with a second crew station behind the first. One forward fuel tank was removed to accommodate an extra seat; this was compensated for by adding a new fuel tank in the rear fuselage. The MiG-23U had the S-21 weapon system, although the radar was later mostly removed. During its production run, both its wings and engine were improved to the MiG-23M standard. Production began at Irkutsk in 1971 and eventually converted to the MiG-23UB. ("Flogger-C") Very similar to MiG-23U except that the Tumansky R-29 turbojet engine replaced the older R-27 installed in the MiG-23U. Production continued until 1985 (for the export variant). A total of 769 examples were built, including conversions from the MiG-23U. ("Flogger-E") Similar to the MiG-23MS (described below), but produced in much fewer numbers and was never exported. Virtually identical to MiG-23MS except the addition of a dielectric head above the pylon, which was often associated with the ground-attack versions—for which it might have been a developmental prototype. ("Flogger-E") This was an export variant, as the '70s MiG-23M was considered too advanced to be exported to Third World countries. It was otherwise similar to MiG-23M, but it had the S-21 standard weapon system, with a RP-22SM (NATO: "Jay Bird") radar in a smaller radome, and the IRST was removed. Obviously, this variant had no BVR capability, and the only air-to-air missiles it was capable of using were the R-3S (NATO: AA-2a "Atoll") and R-60 (NATO: AA-8 "Aphid") IR-guided missiles and the R-3R (NATO: AA-2d "Atoll") semi-active radar homing (SARH) missile. The avionics suite was very basic. This variant was produced between 1973 and 1978 and exported principally to North Africa and the Middle East. ("Flogger-G") This was a specialized air-defense interceptor variant developed for the PVO Strany. It had the same airframe and powerplant as the MiG-23ML, but there is a cut-back fin root fillet instead of the original extended one on other models. Its avionics suite was improved to meet PVO requirements and mission profiles. Its radar was the improved Sapfir-23P, which could be used in conjunction with the gunsight for better look-down/shoot-down capabilities to counter increasing low-level threats like cruise missiles. The IRST, however, was absent. The autopilot included a new digital computer, and it was linked with the Lasur-M datalink. This enabled ground-controlled interception (GCI) ground stations to steer the aircraft towards the target; in such an intercept, all the pilot had to do was control the engine and use the weapons. The MiG-23P was the most numerous PVO interceptor in the 1980s. Around 500 aircraft were manufactured between 1978 and 1981. The MiG-23P was never exported and served only within the PVO in Soviet service. ("Flogger-G") Similar to the MiG-23P except the IRST was restored and the cumbersome radar scope was eliminated because all of the information it provided could be displayed on the new head-up display (HUD). The early "Flogger" variants were intended to be used in high-speed missile attacks, but it was soon noticed that fighters often had to engage in more stressful close-in combat. Early production aircraft had actually suffered cracks in the fuselage during their service career. Maneuverability of the aircraft was also criticized. 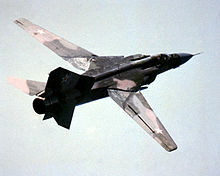 A considerable redesign of the airframe was performed, resulting in the MiG-23ML (L – lightweight), which made it in some ways a new aircraft. Empty weight was reduced by 1250 kg, which was achieved partly by removing a rear fuselage fuel tank. Aerodynamics were refined for less drag. The dorsal fin extension was removed. The lighter weight of the airframe resulted in a different sit on the ground, with the aircraft appearing more level when at rest compared to the nose-high appearance of earlier variants. This has led to a belief that the undercarriage was redesigned for the ML variant, but it is identical to earlier variants. The airframe was now rated for a g-limit of 8.5, compared to 8 g for the early generation MiG-23M/MF "Flogger-B". A new engine model, the R-35F-300, now provided a maximum dry thrust of 84 kN (18,800 lbf), and 127 kN (28,700 lb) with afterburner. This led to a considerable improvement in maneuverability and thrust-to-weight ratio. The avionics set was considerably improved as well. The S-23ML standard included Sapfir-23ML radar and TP-23ML IRST. The new radar was more reliable and a had maximum detection range of about 65 km against a fighter-sized target (25 km in look-down mode). The navigation suite received a new, much improved autopilot. New radio and datalink systems were also installed. The prototype of this variant first flew in 1976 and production began 1978. ("Flogger-G") The later production variant of the "ML" was redesignated the "MLA". Externally, the "MLA" was identical to "ML". Internally, the 'MLA' had an improved radar with better ECM resistance, which made co-operative group search operations possible as the radars would now not jam each other. It also had a new ASP-17ML HUD/gunsight, and the capability to fire improved Vympel R-24R/T missiles. Between 1978 and 1982, around 1,100 "ML/MLA"s were built for both the Soviet Air Force and export customers. As with the MiG-23MF, there were two different MiG-23ML sub-variants for export: the first version was sold to Warsaw Pact countries and was very similar to Soviet aircraft. The second variant had downgraded radar and it was sold to Third World allies. ("Flogger-K") The MiG-23MLD was the ultimate fighter variant of the MiG-23. The main focus of the upgrade was to improve manoeuvrability, especially during high angles of attack (AoA). The pitot boom was equipped with vortex generators, and the wing's notched leading edge roots were 'saw-toothed' to act as vortex generators as well. The flight-control system was modified to improve handling and safety in high-AoA maneuvers. Significant improvements were made in avionics and survivability: the Sapfir-23MLA-II featured improved modes for look-down/shoot-down and close-in fighting. A new SPO-15L radar warning receiver was installed, along with chaff/flare dispensers. The new and very effective Vympel R-73 (NATO: AA-11 "Archer") short-range air-to-air missile was added to inventory. No new-build "MLD" aircraft were delivered to the VVS, as the more advanced MiG-29 was about to enter production. Instead, all Soviet "MLD"s were former "ML/MLA" aircraft modified to "MLD" standard. Some 560 aircraft were upgraded between 1982 and 1985. As with earlier MiG-23 versions, two distinct export variants were offered. Unlike Soviet examples, these were new-build aircraft, though they lacked the aerodynamic refinements of Soviet "MLD"s; 16 examples were delivered to Bulgaria, and 50 to Syria. These were the last single-seat MiG-23 fighters made, and the last example rolled off the production line in December 1984. ("Flogger-F") The requirement for a new fighter-bomber had become obvious in the late 1960s, and the MiG-23 appeared to be suitable type for such conversion. The first prototype of the project, "32–34", flew for the first time on 20 August 1970. The MiG-23B had a redesigned forward fuselage, but was otherwise similar to the MiG-23S. 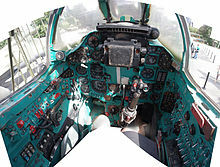 The pilot seat was raised to improve visibility, and the windscreen was armoured. The nose was flat-bottomed and tapered down. There was no radar; instead it had a PrNK Sokol-23 ground attack sight system, which included an analogue computer, a laser range-finder and the PBK-3 bomb sight. The navigation suite and autopilot were also improved to provide more accurate bombing. It retained the GSh-23L gun, and its maximum warload was increased to 3000 kg by strengthening the pylons. Survivability was improved by an electronic warfare (EW) suite and inert gas system in the fuel tanks to prevent fire. The first prototype had a MiG-23S type wing, but subsequent examples had the larger "type 2" wing. Most importantly, instead of an R-29 variant, aircraft was powered by the Lyulka AL-21 turbojet with a maximum thrust of 113 kN (25,400 lbf). The production of this variant was limited, however, as the supply of AL-21 engines was needed for the Sukhoi Su-17 and Su-24 production lines. In addition, this engine was not cleared for export. Only three MiG-23B prototypes and 24 production aircraft were produced in 1971–72. ("Flogger-H") These were exported to Warsaw Pact countries—but not to Third World customers—and thus had the PrNK-23 navigation and attack system. Additional radar warning receivers were also mounted on the intakes. ("Flogger-H") Produced since 1973, the MiG-23BN was based on MiG-23B, but had the same R-29-300 engine as contemporary fighter variants. They were also fitted with "type 3" wings. There were other minor changes in electronics and equipment, and some changes were made during its long production run. Serial production lasted until 1985, with 624 built. Most of them were exported, as the Soviets always viewed it as an interim type and only a small number served in Frontal Aviation regiments. As usual, a downgraded version was sold to Third World customers. This variant proved to be fairly popular and effective. The most distinctive identifying feature between the MiG-23B and MiG-23BN was that the former had the dielectric head just above the pylon, which was removed from the MiG-23BN. In India, the last MiG-23BNs were flown by 221 Squadron (Valiants) of Indian Air Force and were decommissioned on 6 March 2009. Wing Commander Tapas Ranjan Sahu, was the last pilot to land the MiG-23BN on that day. ("Flogger-D") This was a MiG-23BK upgrade, with the PrNK-23M replacing the original PrNK-23, and a digital computer replacing the original analog computer. Introduced into service as the MiG-27. 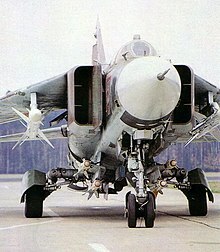 ("Flogger-D") The MiG-23 ground-attack versions had too much "fighter heritage" for an attack aircraft, and a new design with more radical changes was developed (later to be re-designated as the MiG-27). The MiG-23BM experimental aircraft served as a predecessor to the MiG-27 and it differs from the standard MiG-23BM and other MiG-23 models in that its dielectric heads were directly on the wing roots, instead of on the pylons. (NATO: "Flogger-D") Introduced in 1975, simplified ground-attack version with simple pitot air intakes, no radar and a simplified engine with two position afterburner nozzle. was a proposed reconnaissance variant; the project was never finished. "MLG" and "MLS" were further fighter upgrades with new radar and EW equipment, partly the same as in MiG-29; these variants were also fitted with helmet-mounted sights and were basically MiG-23MLD subvariants. They were abandoned in favor of the then ongoing MiG-29 program. was a carrier-borne fighter variant based on the MiG-23ML. The MiG-23AI was to be a dedicated fighter. The MiG-23AB was to be an attack-dedicated variant. MiG-23AR a dedicated reconnaissance variant. Planned to be powered by either two new R-33 engines or one R-100. Was basically a MiG-23M fitted with a Saphir-23MLA-2. In the late 1990s, Mikoyan, following their successful MiG-21 upgrade projects, offered an upgrade which featured new radar, new self-defense suite, new avionics, improved cockpit ergonomics, helmet-mounted sight, and the capability to fire Vympel R-27 (NATO: AA-10 "Alamo") and Vympel R-77 (NATO: AA-12 "Adder") missiles. The projected cost was around US$1 million per aircraft. Smaller upgrades were also offered, which consisted of only improving the existing Sapfir-23 with newer missiles and upgrades of other avionics. Airframe life extension was offered as well. An export upgrade including the "Saphir" radar fitted to their MiG-23MLs; this radar upgrade allows the Angolan MiG-23s to fire new types of air-to-air and air-to-ground weapons. This radar upgrade seems to be the same offered as part of the radar upgrade. 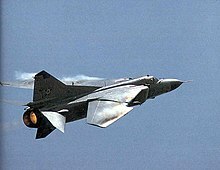 (flying laboratory) MiG-23s and MiG-25s were used as the first jet fighter platforms to test a new in-cockpit warning system with a prerecorded female voice to inform pilots about various flight parameters. A female voice was chosen specifically to provide a clear and intuitive distinction between communications from the ground and the messages from internal systems, since ground communications virtually always came in male voice in Soviet service. The idea proved successful for many reasons besides the original one. Ethiopian Air Force; 10 MiG-23BN/UBs in service for ground attack role. The interceptor variant, MIG-23ML, was withdrawn from service. Military of Kazakhstan. 2 units of training Mig-23UB, as of 2018. Libyan Air Force; initially at least five MiG-23ML/UB in service, split among different factions. Four lost. Only one in service with the New General National Congress, while others (e.g. serial 453) may have been made airworthy by both factions. Sudanese Air Force; 3 MiG-23MS/UBs in service. Four were refurbished locally in 2016, after nearly 20 years in storage. One lost during testing. Afghan Air Force. MiG-23BN/UBs may have served with the Afghan Air Force from 1984. It is unclear whether these were merely Soviet aircraft wearing Afghan colors. Algerian Air Force. First 40 arrived in 1979. Bulgarian Air Force. A total of 90 MiG-23s served the Bulgarian Air Force from 1976 to their withdrawal from service in 2004. The exact count is: 33 MiG-23BN, 12 MiG-23MF, 1 MiG-23ML, 8 MiG-23MLA, 21 MiG-23MLD and 15 MiG-23UB. Czech Air Force. The MiGs were retired in 1994 (BN, MF version) and 1998 (ML, UB variant). Czechoslovakian Air Force. MiG-23s were transferred to the Czech Republic. East German Air Force; transferred to (West) German Air Force. The German Air Force gave two MiG-23s to the United States Air Force and one to a museum in Florida, the others were given away to others states or scrapped. Egyptian Air Force. Used until Egypt turned towards Western Governments. Six MiG-23BN/MS/Us were sent to China in exchange for military hardware; China used them to reverse engineer the MiG-23 as the Q-6 but since the Chinese could not reverse engineer the R-29 and build a reliable turbofan, the only MiG-23 elements that were used ended in the J-8II. At least eight were transferred to USA for evaluation. German Air Force; In 1990 the West German Air Force inherited 18 MiG-23BNs, 9 MiG-23MFs, 28 MiG-23MLs, 8 MiG-23UBs from East Germany. Hungarian Air Force Mikoyan-Gurevich MiG-23MF. Hungarian Air Force; 16 MiG-23s served and were withdrawn in 1997; the exact count is: 12 MiG-23MFs and four MiG-23 UBs (one of them was purchased in 1990 from the Soviet Air Force). 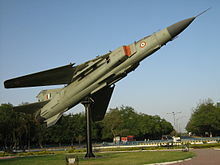 An Indian MiG-23MF on display at a crossroads in Gandhinagar. Indian Air force. The MiG-23BN ground attack aircraft was phased out on 6 March 2009 and the MiG-23MF air defence interceptor phased out in 2007. A total of 40 MiG-23MF, 95 MiG-23BN and had been obtained, only 15 MiG-23UB in storage. 12 Mig-23s flown over from Iraq in 1991 in storage. Kyrgyzstan MiG-23 on display in Tokmok. Libyan Air Force; had 130 MiG-23MS/ML/BN/UBs in service (most in storage) prior to the 2011 Libyan civil war. What remains has been passed on to the successor government. Polish Air Force. A total of 36 MiG-23MF single-seaters and six MiG-23UB trainers were delivered to the Polish Air Force between 1979 and 1982. The last of them were withdrawn in September 1999. During the period four planes were lost in accidents. Namibian Air Force; had two MiG-23 aircraft in service. Romanian Air Force. A total of 46 MiG-23 served from 1979 until 2001 and were withdrawn in 2003; the exact count is: 36 MiG-23MF and 10 MiG-23 UB. Russian Air Force. Approximately 500, all in reserve. Air Force of Zimbabwe ; given by Libya. MiG-23 on display at the Minsk World theme park in Shenzhen, PRC. MiG-23s were obtained from Egypt, and an attempt was made to reverse engineer them as the Nanchang Q-6. The program did not go ahead and the Q-6 was not built, but some features from the MiG-23 features were incorporated into the J-8II. China currently displays the MiG-23 in several air museums. One ex-Syrian MiG-23 flown by a defecting pilot to Israel. Samples obtained from Egypt and were mostly stationed in Nellis Air Force Base. The U.S. Air Force operated a small number of MiG-23s, officially designated YF-113, as both test and evaluation aircraft and in an aggressor role for fighter pilot training, from 1977 through 1988 in a program codenamed "Constant Peg". Some ex-Iraqi MiG-23s have been used by Flight Test Center (VOC) in the early 1990s. According to the FAA there are 11 privately owned MiG-23s in the U.S.
26 April 1984 (1984-04-26): U.S. Air Force Lieutenant General Robert M. Bond was killed when the MiG-23 he was piloting crashed at the Nevada Test Site. At the time of the mishap, Lt Gen Bond was serving as Vice Commander of Air Force Systems Command at Andrews Air Force Base, Maryland, USA. 4 July 1989 (1989-07-04): a stray Soviet MiG-23M flew 900 km (600 mi) with no-one at the controls, after the pilot had ejected shortly after takeoff, and eventually crashed into a house in Belgium, killing one person. 22 December 1992 (1992-12-22): a Libyan Boeing 727 collided with a Libyan Air Force MiG-23 near Tripoli, causing the death of all 157 people on board the jetliner. According to the MiG-23ML manual, the MiG-23ML has a maximum sustained turn rate of 14.1 deg/sec and a maximum instantaneous turn rate of 16.7 deg/sec. The MiG-23ML accelerates from 600 km/h (373 mph) to 900 km/h (559 mph) in 12 seconds at the altitude of 1000 meters. The MiG-23 accelerates at the altitude of 1 km from 630 km/h (391 mph) to 1300 km/h (808 mph) in 30 seconds and at the altitude of 10–12 km will accelerate from Mach 1 to Mach 2 in 160 seconds. ^ Lake 1992, pp. 43–44. ^ Mladenov 2004, p. 45. ^ Belyakov and Marmain 1992, pp. 351–355. ^ Lake 1992, pp. 43–45. ^ Lake 1992, p. 45. ^ Boyne, Walter J. (2013). Beyond the wild blue a history of the u.s. air force, 1947–2007. New York: St. Martin's Press. p. 493. ISBN 1429901802. ^ Goebel, Greg. "The Mikoyan MiG-23 & MiG-27 "Flogger" – [1.0] Fighter Floggers". AirVectors.net. v1.0.5 – chapter 1 of 2, 01 jan 15, greg goebel, public domain. Retrieved 14 March 2015. ^ Hurley, Matthew M. "The BEKAA Valley Air Battle, June 1982: Lessons Mislearned?" Archived 23 September 2008 at the Wayback Machine Airpower Journal, Winter 1989. Retrieved: 28 January 2011. ^ "Blooding the MiG-23." Archived 16 January 2014 at the Wayback Machine MiG-23 Flogger, The MiG-23 combat record. Retrieved: 28 January 2011. ^ Walter J. Boyne (2002). Air Warfare: An International Encyclopedia. ABC-Clio. p. 416. ^ Pazynich, Sergey. "Агрессоров" (Translation: From the history of Soviet 'Aggression')" (in Russian). airforce.ru. Retrieved: 28 January 2011. ^ "F-16 Air Forces – Pakistan". f-16.net. Retrieved 29 November 2015. ^ "Airframe Details for F-16 #81-0918". f-16.net. Retrieved 29 November 2015. ^ Weintaub, Richard M. "Afghanistan Says It Downed F16 Fighter From Pakistan: U.S. Officials Say Soviet Pilots Involved." Washington Post, 2 May 1987. Retrieved: 28 January 2011. ^ Weisman, Steven R. "Afghans down a Pakistani F-16, saying fighter jet crossed border." The New York Times, 2 May 1987. Retrieved: 28 January 2011. ^ Sander Peeters. "South Arabia and Yemen, 1945–1995". acig.info. Retrieved 29 November 2015. ^ "Soviets bolster an Arab ally. Military buildup in South Yemen worries US officials". The Christian Science Monitor. Retrieved 29 November 2015. ^ Sander Peeters. "Israeli — Syrian Shadow-Boxing". Retrieved 14 November 2014. ^ "Oryx Blog". spioenkop.blogspot.com.au. Retrieved 29 November 2015. ^ Matthew Weaver (24 July 2012). "Syria crisis: clashes and prison mutiny in Aleppo". The Guardian. Retrieved 29 November 2015. ^ "Aleppo: BBC journalist on Syria warplanes bombing city". BBC News. Retrieved 29 November 2015. ^ McElroy, Damien; Samaan, Magdy (24 July 2012). "Syria's regime uses fighter jets for first time as it struggles to contain rebellion". The Daily Telegraph. London. ^ "Syria crisis: Rebels 'shoot down warplane'". BBC News. Retrieved 29 November 2015. ^ "Turkish F-16 shoots down a Syrian MiG-23". Retrieved 14 November 2014. ^ "Chronological Listing of Iranian Air Force Grumman F-14 Tomcat Losses & Ejections." Archived 4 July 2009 at the Wayback Machine ejection-history.org.uk. Retrieved: 28 January 2011. ^ Cooper, Tom. "Iraqi Air-to-Air Victories since 1967." Archived 11 November 2009 at the Wayback Machine ACIG, 25 August 2007. Retrieved: 28 January 2011. ^ David Nicolle; Tom Cooper (2004). Arab MiG-19 and MiG-21 Units in Combat. Osprey Publishing. p. 82. ^ "Iraqi Air-to-Air Victories since 1967". ACIG. Retrieved 14 November 2014. ^ Cooper and Bishop 2003, p. 46. ^ Cooper and Bishop 2004, pp. 85—88. ^ Cooper and Bishop 2003, pp. 87—88. ^ a b "Потери ВВС Ирака". airwar.ru. Retrieved 14 November 2014. ^ Sander Peeters. "Iraqi Air-to-Air Victories since 1967". ACIG. Retrieved 14 November 2014. ^ Sander Peeters. "Iranian Air-to-Air Victories 1976–1981". ACIG. Retrieved 14 November 2014. ^ Sander Peeters. "Iranian Air-to-Air Victories, 1982-Today". ACIG. Retrieved 14 November 2014. ^ a b "iranian_F_4_Phantom_LOSSES". ejection-history.org.uk. Archived from the original on 10 July 2015. Retrieved 6 April 2015. ^ Cooper and Bishop 2004, pp. 27—34. ^ Sander Peeters. "Iraqi Invasion of Kuwait; 1990 - www.acig.org". acig.info. Retrieved 29 November 2015. ^ "Coalition Air-to-Air Victories in Desert Storm". Retrieved 14 November 2014. ^ "USAF Manned Aircraft Combat Losses 1990–2002" (PDF). ^ "RAF – RAF Tornado Aircraft Losses". mod.uk. Archived from the original on 11 October 2011. Retrieved 29 November 2015. ^ "Aerei Militari – Tornado IDS". aereimilitari.org. Retrieved 29 November 2015. ^ "F-16 Aircraft Database: F-16 Airframe Details for 86-0262." F-16.net. Retrieved: 16 May 2008. ^ "Cuban Air-to-Air Victories". Retrieved 14 November 2014. ^ Cooper, Tom. "Angola: Claims & Reality about SAAF Losses." Central, Eastern & Southern Africa Database, 2 September 2003. Retrieved: 19 October 2011. ^ Heitman, Helmoed-Romer. War in Angola: The Final South African Phase. Lauderhill, Florida: Ashanti Publishing, 1990. ISBN 978-0-620-14370-7. ^ Cooper, Tom. "Libya & Egypt, 1971–1979." Western & Northern Africa Database, 13 November 2003. Retrieved: 28 January 2011. ^ Cooper, Tom (28 December 2017). "The Final Flight of Ezzedin Khalil". warisboring.com. Retrieved 5 August 2018. ^ "Italians conclude crashed plane was shot down in 1980". ^ "Libyan MIG-23 Shot Down Over Chad, Army Says". Los Angeles Times. 6 January 1987. ^ Greenhouse, Steven (9 September 1987). "Big Libyan Losses Claimed By Chad". The New York Times. ^ Aneja, Atul. "Air strikes deter advance on Tripoli." The Hindu News, 1 March 2011. ^ Karam, Souhail et al. "Libyan website reports rebels sink Gaddafi ships." reuters.com, 15 March 2011. Retrieved: 20 March 2011. ^ Pannell, Ian. "Fighter jet 'shot down' over Benghazi." BBC, 19 March 2011. ^ "Benghazi 'bombarded by pro-Gaddafi forces'." BBC News, 20 March 2011. ^ "Update 1-French forces destroy seven Libyan aircraft on ground." Reuters, 26 March 2011. ^ Leyne, Jon. "Libya: Fierce battle for second day in Ajdabiya." BBC, 10 April 2011. Retrieved: 12 April 2011. ^ "Retired general launches war against Islamists in eastern Libya". Janes. Retrieved 6 April 2015. ^ "Libya Dawn aircraft crashes during raid on Zintan". janes.com. Retrieved 29 November 2015. ^ Ranter, Harro. "Accident Mikoyan-Gurevich MiG-23ML 6472, 04 Jan 2016". aviation-safety.net. ^ Ranter, Harro. "Accident Mikoyan-Gurevich MiG-23ML 6132, 08 Feb 2016". aviation-safety.net. ^ "Another Libyan Air Force plane shot down or crashed in Benghazi". 12 February 2016. ^ Martin, Guy. "Last flyable Libyan Air Force MiG-23 shot down – defenceWeb". www.defenceweb.co.za. ^ Arnaud, Delalande (28 February 2016). "AeroHisto – Aviation History: Libyan National Army Air Force MiG-23ML serial #26453 entered in service". ^ a b TeamAirsoc. "LIBYAN AIR FORCE LOST ITS LAST MIG-23 - airsoc.com". ^ Arnaud, Delalande (29 March 2016). "AeroHisto – Aviation History: "Libyan airstrikes" situation update 26–28 March 2016". ^ Arnaud, Delalande (5 May 2016). "AeroHisto – Aviation History: Libyan National Army Air Force has now two MiG-23BNs operational". ^ Arnaud, Delalande (13 May 2016). "AeroHisto – Aviation History: "Libyan airstrikes" situation update 7 – 13 May 2016". ^ "Eritrea's Chief Sees No Halt In Border War With Ethiopia". The New York Times. 7 June 1998. ^ "Ethiopia hits Asmara airport". BBC News. 29 May 2000. ^ Sander Peeters. "II Ethiopian Eritrean War, 1998–2000". ACIG. Retrieved 14 November 2014. ^ John Pike. "1999 Kargil Conflict". globalsecurity.org. Retrieved 29 November 2015. ^ "МиГ-23 в Анголе (Translation: MiG-23 in Angola)" (in Russian). airwar.ru. Retrieved: 28 January 2011. ^ "Family explains Cuban defection." Gainesville Sun, 18 July 1994. Retrieved: 28 January 2011. ^ Kondaurov, V. N. "Испытания на Волжских Берегах (Translation: Testing on the Volga shores" (in Russian). testpilot.ru. Retrieved: 28 January 2011. ^ Davies and Dildy 2007, p. 91. ^ "МиГ-23М (Translation: MiG-23M)" (in Russian). airwar.ru. Retrieved: 28 January 2011. ^ "Libya- LAF photos of MiG-23 that was fully restored after 20 years being out of service, now flying from Benghazi - Today news from war on Daesh, ISIS in English from Somalia, Egypt, Afghanistan, Iraq, Syria - isis.liveuamap.com". Today news from war on Daesh, ISIS in English from Somalia, Egypt, Afghanistan, Iraq, Syria - isis.liveuamap.com. ^ Oryx (26 September 2016). "Oryx Blog: Back from retirement, Sudan's MiG-23s take to the skies". ^ "Portfolio: Algerian Air Force thru History". Retrieved 14 November 2014. ^ "India decommissions last MiG-23 ground support aircraft." RIA Novosti, 3 June 2009. Retrieved: 28 January 2011. ^ " Last Flight of the MiG-23 BN." Archived 9 June 2011 at the Wayback Machine bharat-rakshak.com. Retrieved: 28 January 2011. ^ "Namibia – Security Information." Archived 8 August 2009 at the Wayback Machine Iss.co.za. Retrieved: 24 August 2012. ^ Brinkley, Joel. "Syrian pilot of MIG-23 is said to defect to Israel." The New York Times, 12 October 1989. Retrieved: 12 May 2010. ^ Fulghum, David A. "MiGs in Nevada", Aviation Week & Space Technology, 27 November 2006. ^ "MiG-23." Archived 5 September 2009 at the Wayback Machine U.S. FAA – Registry of Aircraft. Retrieved: 28 January 2011. ^ "MiG-23." Warbirds of Delaware. Retrieved: 28 January 2011. ^ "Mig-23." Cold War Air Museum. Retrieved: 28 January 2011. ^ "Corriere della Sera (Translation: Sixteen years ago the fighter fell on the Sila)" (in Italian). corriere.it. Retrieved: 28 January 2011. ^ "Aircraft Losses: F-117A: The crash of General Robert M. Bond." Archived 23 March 2012 at the Wayback Machine f-117a.com. Retrieved: 7 July 2011. ^ a b c "MiG-23 Flogger, Mikoyan-Gurevich". fighter-planes.com. Retrieved 19 February 2018. Babich, Vladimir (1999). Истребители МиГ-23 в Ливанской войне [MiG-23 Fighters in the Lebanon War]. Авиация и время [Aviation and Time] (in Russian) (2). Belyakov, R.A.; Marmain, J. (1994). MiG: Fifty Years of Secret Aircraft Design. Shrewsbury, UK: Airlife Publishing. ISBN 1-85310-488-4.
Cooper, Tom; Bishop, Farzad (2003). Iranian F-4 Phantom II Units in Combat. London: Osprey Publishing. ISBN 1-84176-658-5.
Cooper, Tom; Bishop, Farzad (2004). Iranian F-14 Tomcat Units in Combat. London: Osprey Publishing. ISBN 1-84176-787-5. Davies, Steve; Dildy, Doug (2007). F-15 Eagle Engaged: The World's Most Successful Jet Fighter. London: Osprey Publishing. ISBN 978-1-84603-169-4. Gordon, Yefim; Dexter, Keith (2005). MiG-23/27: Soviet Swing-Wing Fighter/Strike Aircraft. Hinckley, UK: Midland Publishing. ISBN 1-85780-211-X. Ilyin, Vladimir (2000). МиГ-23: долгий путь к совершенству [MiG-23: Long Path to Perfection]. Авиация и время [Aviation and Time] (in Russian) (2). Koenig, William; Scofield, Peter (1983). Soviet Military Power. Greenwich, Connecticut: Bison Books. ISBN 0-86124-127-4. Lake, John (Spring 1992). "Mikoyan MiG-23/27 Flogger". World Air Power Journal (Volume 8): 40–5. ISBN 1-874023-73-5. ISSN 0959-7050. Markovskiy, Victor (1997). "Жаркое небо Афганистана: Часть IX" [Hot Sky of Afghanistan: Part IX]. Авиация и время [Aviation and Time] (in Russian) (3). Mladenov, Alexander (June 2004). "Mikoyan MiG-23 Floggers". Air International. 66 (6): 44–49. ISSN 0306-5634. Wikimedia Commons has media related to Mikoyan-Gurevich MiG-23.